EURUSD is chiefly under the influence of economic reports such as Business Confidence reports in Eurozone and Personal Income and Spending Reports in the US. The support rests at 1.11090 with resistance at 1.11390 which both lines are below the weekly pivot point at 1.12020. The EMA of 10 is moving with bearish bias along the bearish channel and it is above the EMA of 100 and the EMA of 200. The RSI is moving in oversold area, the Stochastic is moving in low ranges while showing upward momentum and the MACD indicator is in neutral territory. The ADX is showing sell signals. 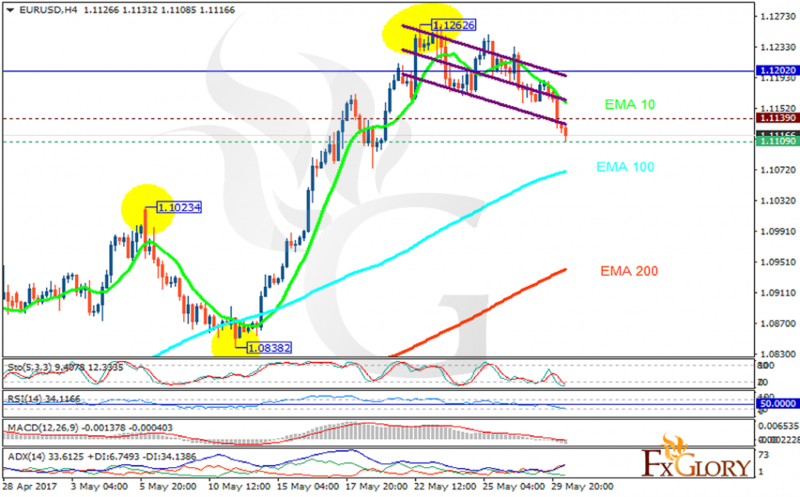 The 1.11 level seems to be supportive therefore EURUSD will start its correction pattern soon growing towards 1.14 area.